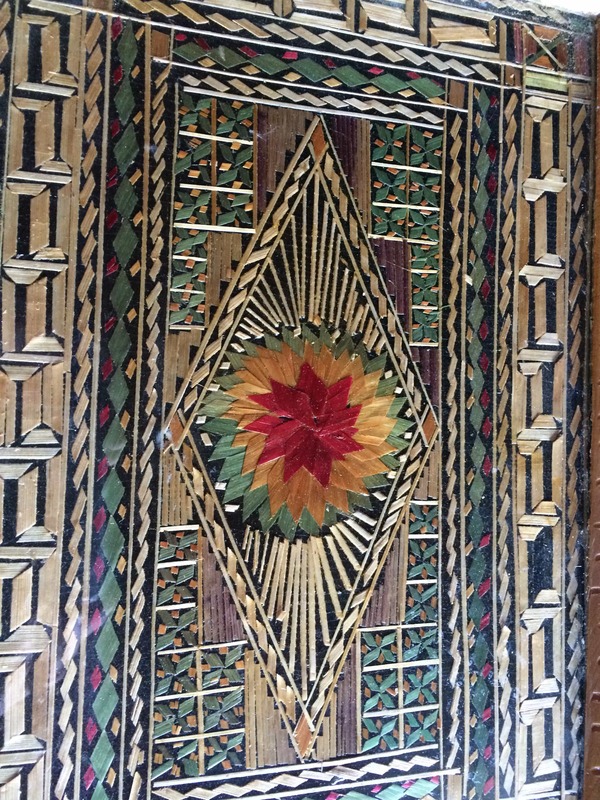 Throughout my straw art journey of learning, I had always heard the story the intricate straw mosaic trays, similar to the one above, are from Greece. I had also been told the straw trays were from Spain. I had to know more about this area of straw work. 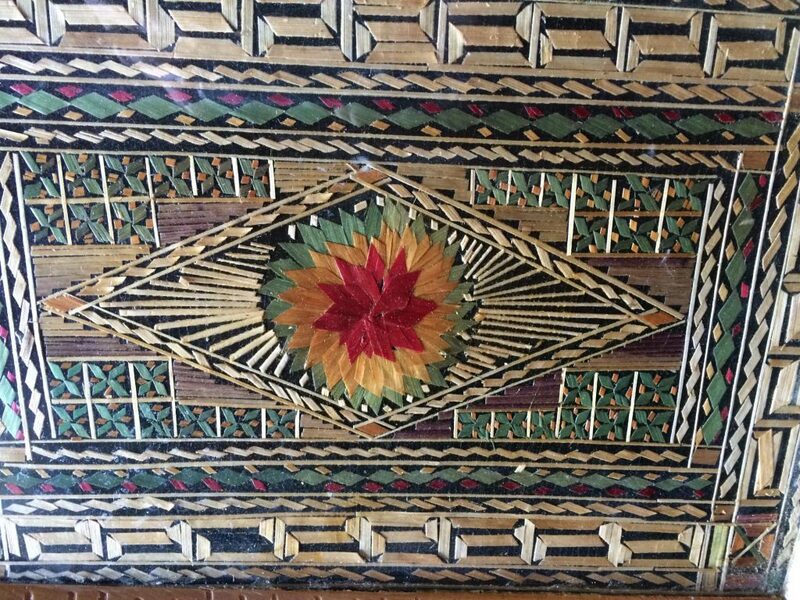 To date no one has documented who made these trays, why they were made, what they were made for, when, or where, or by who this style of straw applique art was done. So the truth is, they are a real mystery. 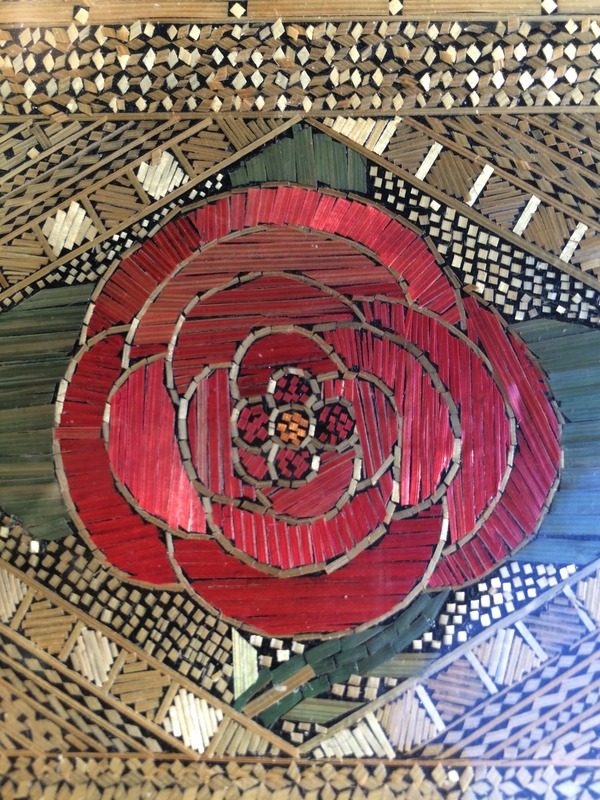 Rumors abound about these beautiful straw mosaic trays. Their very existence today is due to their design. 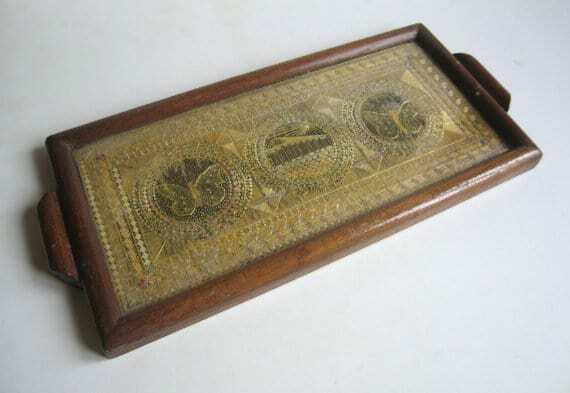 Glass topped trays exposing the straw design affixed to a wooden tray. The glass protects the individual straw pieces. Despite the protective glass, loose straw will move. 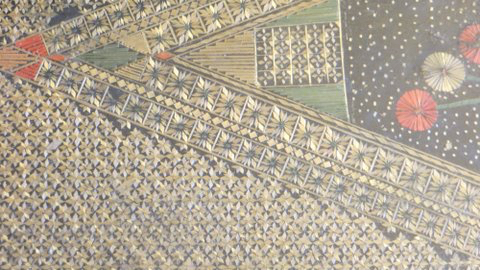 As a result it is common to find patterns in some of the trays trays incomplete in their appearance due to straw movement. 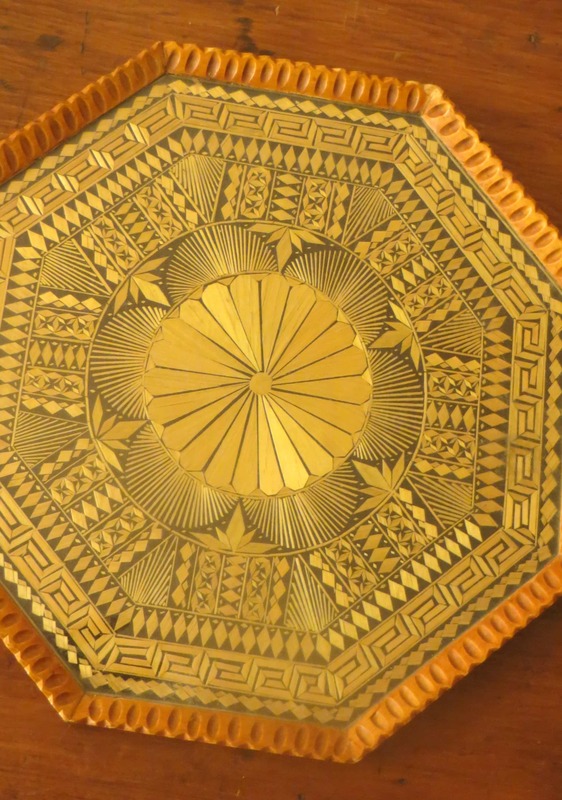 Though these trays were most commonly rectangular in shape, octagonal shaped trays were made too . The sizes of the trays vary from one to another. One rectangular tray may be approximately 14 1/2 inches by 6 inches +/-. 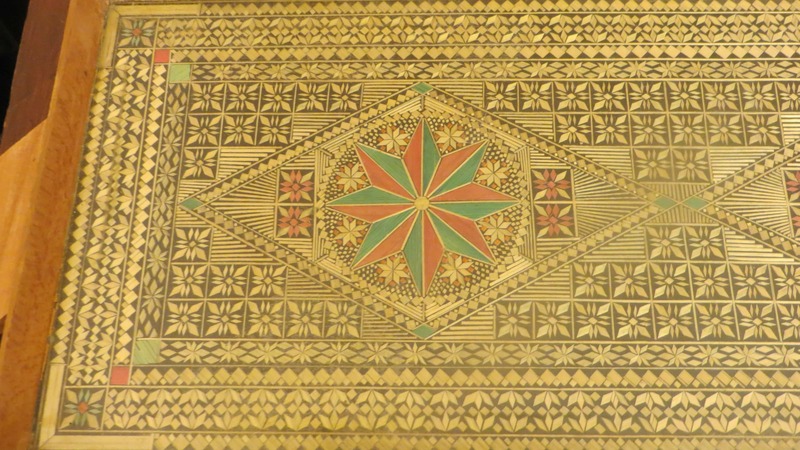 One octagonal tray is more than 10 inches across. 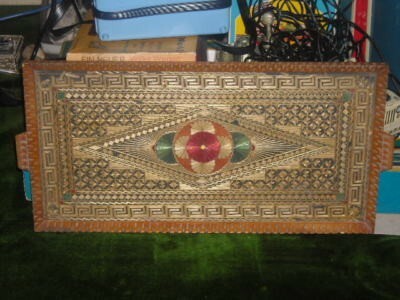 But as every tray appears to be hand made, they all vary in width as well as length. Because they are hand made there has been no duplication in any of their designs noted. 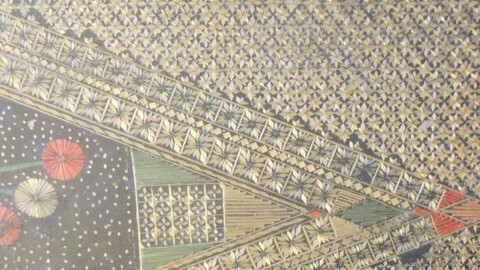 For whatever reason they were created they are very special examples of straw appliqué captured in a utilitarian piece. Due to their variations in sizes we do not believe they were mass produced. There may of course be other shapes and sizes yet to be discovered and documented. 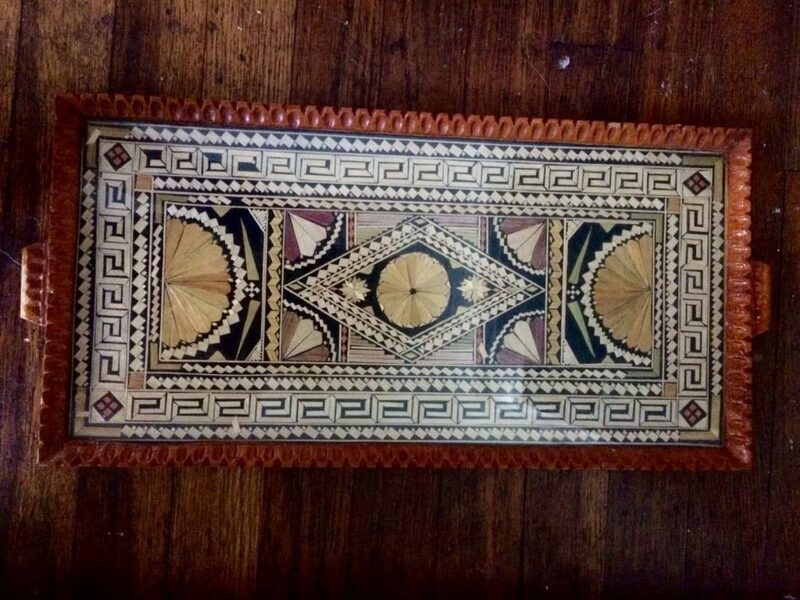 There are many explanations as to the origin of these trays. Some people attribute them to be made by prisoners in the 1940s. Whose prisoners and why? Some also attribute them as having been made in the late 1800s. If so, for what purpose? 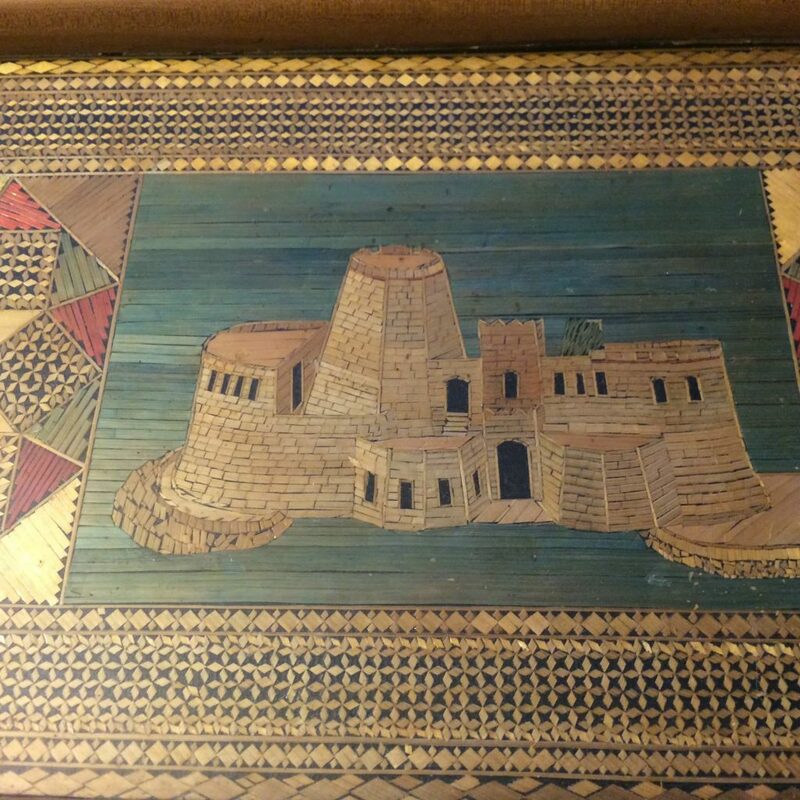 Another source informs us the trays were made between 1936 and 1940 by prisoners on the island of Nissiros and were gifts to family members by the inmates. That may very well be accurate but why were they produced for only 4 years? Other claims they were made by prisoners in the 1960s. Who were the prisoners, held more than 50 years ago? Why would prisoners make trays? Another theory states they hail from the Island of Corfu in the Ionian Pelagos, and are a kind of “famous folk art”. Despite our best efforts, we could find no additional references or sources about them associated with this location. Nothing we can find thus far substantiates any of these claims. Octagonal straw tray courtesy,© The Straw Shop Collection. 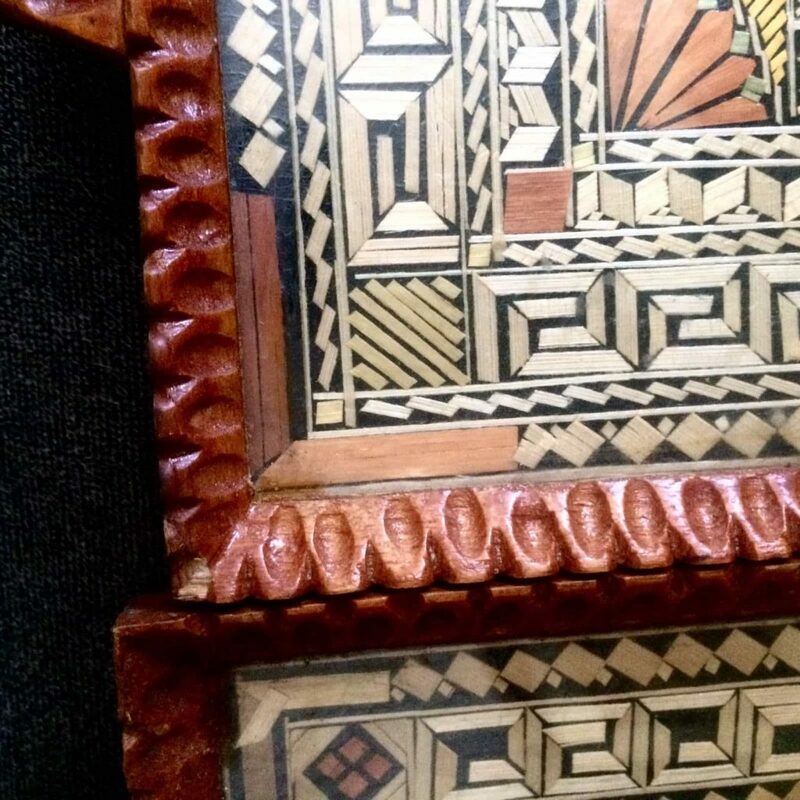 Upon inspection, the wooden trays are not made from woods specific to one country or geographic area. 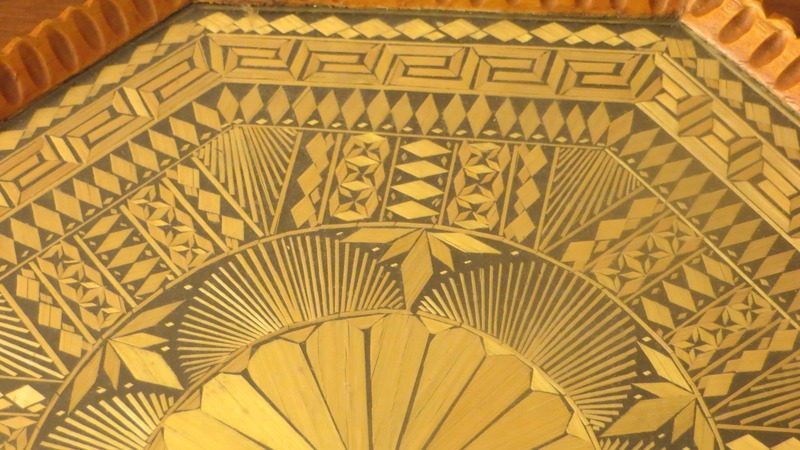 The tool used to carve the decorative tray rim, appearing on some trays, is called a gouge. These wood carving tools have been around for hundreds of years but every metal gouge was hand made for a specific purpose until the early 1900s when sets of gouges were commercially mass-produced. The tool used is not age definitive either. The join found in some tray corners are generic. Other trays have different corner joining. This second method is a locking join known as a spline corner join and is universally common in wood practice. 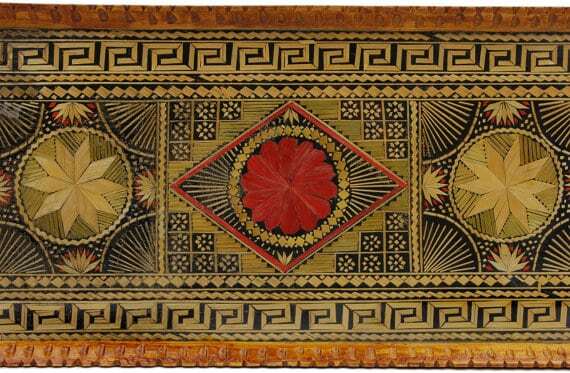 Some trays have an applied varnish on the edges which is also unremarkable as to origin. There are no nails present in their work. Why do the dates surrounding these trays, according to different “histories” out there, span a possible 130 years and yet nothing is documented about them? Who? What? When? Where? Why? It is a true mystery. Why were they made in the form of a serving tray? Was there a specific functionality for the trays, such as a wedding tray, or something for another occasion? Were they perhaps made specifically for sale and export? And if so, where and by who? Imagine the time required for selecting, preparing, cutting and affixing every single piece of straw while the design is created? 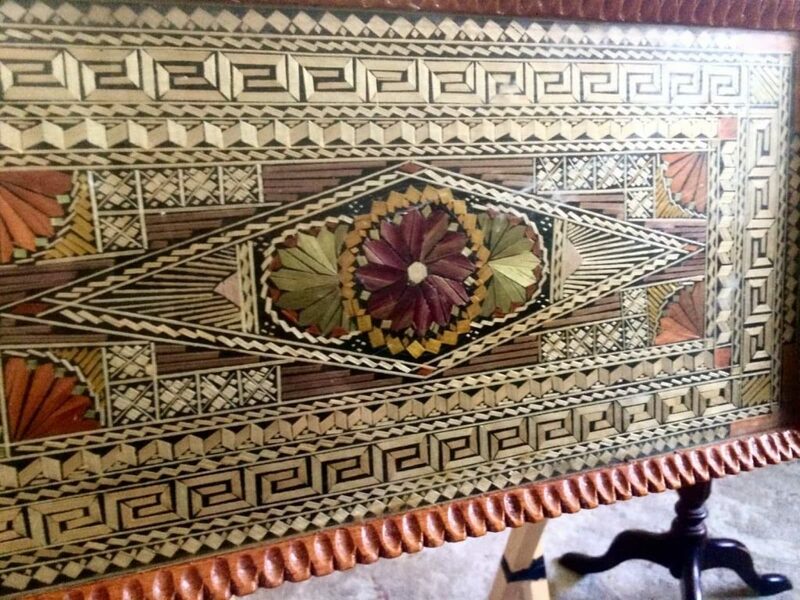 Many of these trays demonstrate the patience and artistic skill required to create their unique, individual designs as well as the hundreds of required hours of work needed in order to create them. 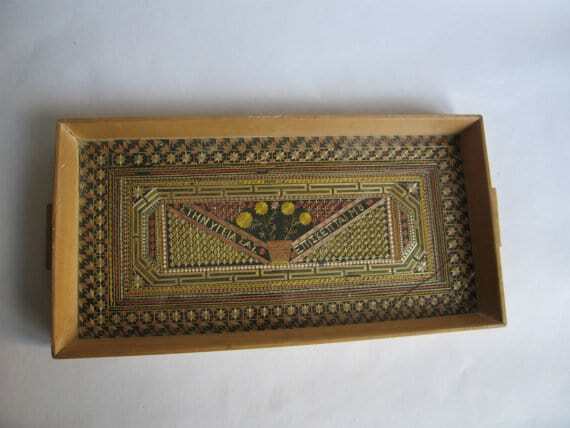 These trays are truly an overlooked and unappreciated area of straw art. 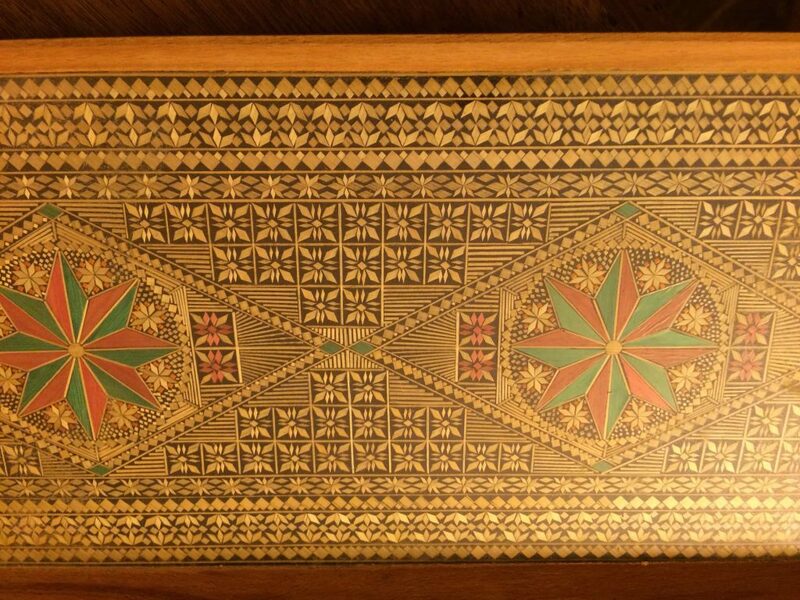 We simply don’t know who, when, where or why these trays were made. 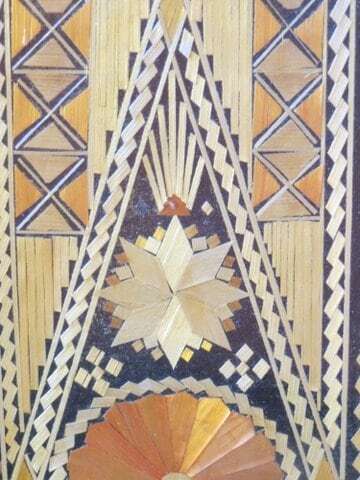 We do know they are preserved examples of straw appliqué in a utilitarian piece. 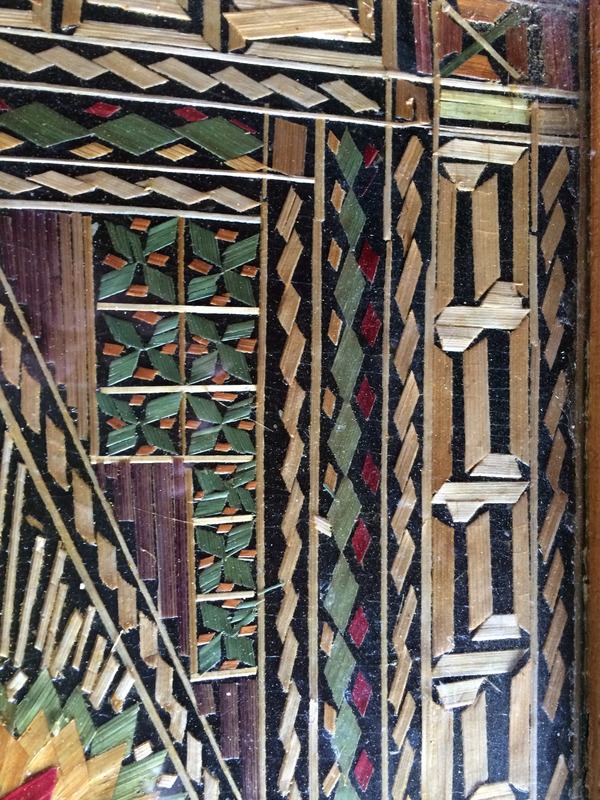 To date we have not located an example of straw work in any accredited museum collection. 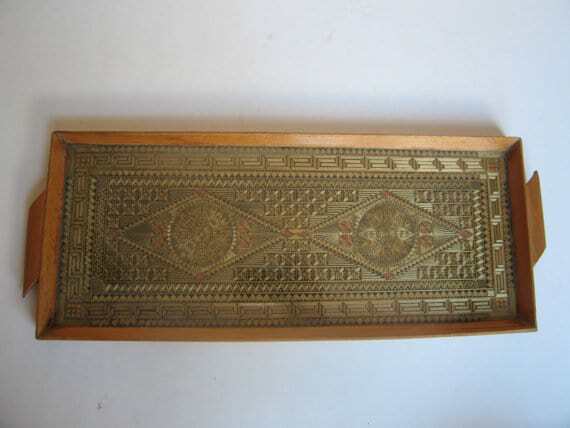 One might argue a common feature known as a Greek key pattern appearing on many trays must mean they are Greek. 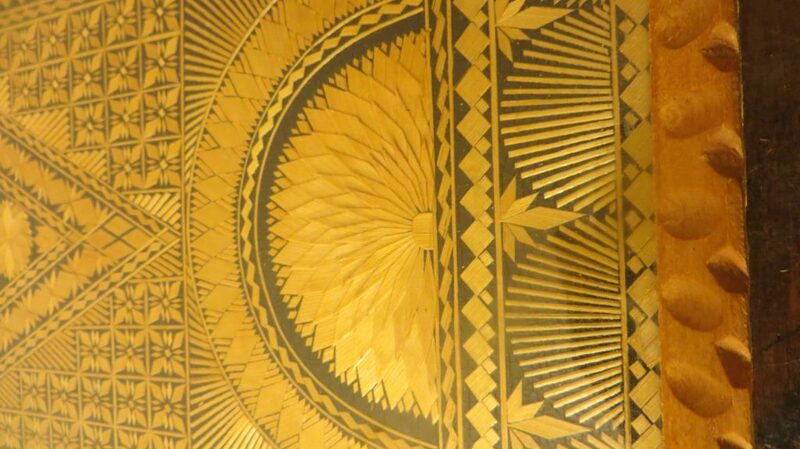 The Greek key design is an interlocking rectangular pattern constructed from one continuous line. 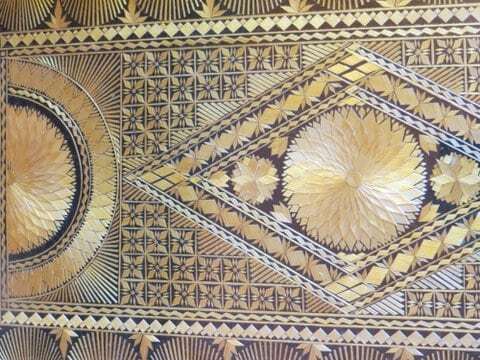 Variations of this pattern has and is used by people worldwide for more than 200 years. In our research, a few trays have been discovered with lettering. The below image was translated from Greek to a common woman’s name, such as Mary Smith, and means nothing necessarily identifiable. 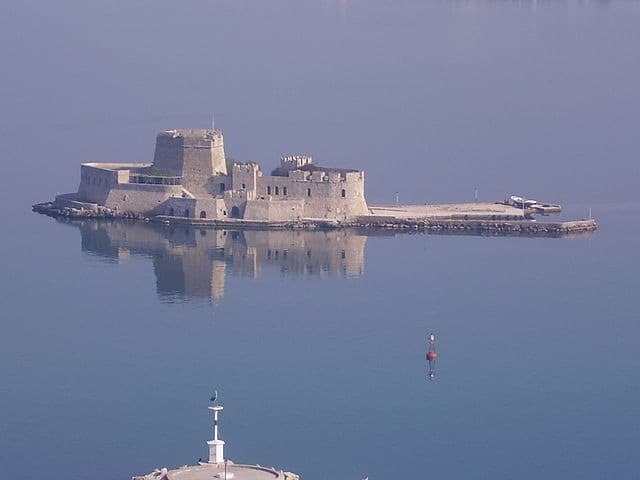 A Venetian fortress named Bourtzi in Nafplio, Greece is shown below. The straw tray shown below is very unusual as it is a depiction of an actual location. 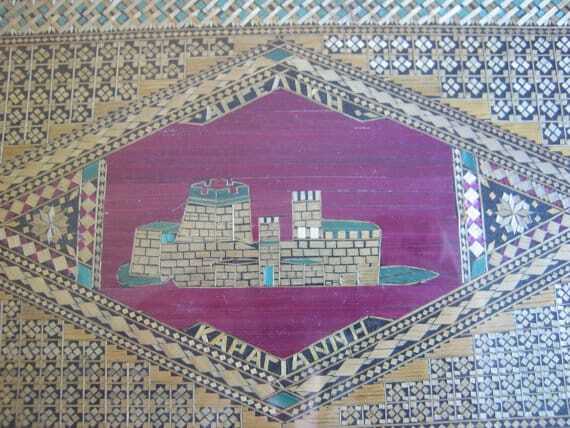 In addition the detailed tray shown below has the inscription “ΣΤΗΝ ΥΓΕΙΑ ΣΑΣ ΕΠΙΣΚΕΠΤΑΙ ΜΟΥ” which means “cheers my visitors”. So perhaps they were made for a housewarming gift? Upon further examination the straw work varies. 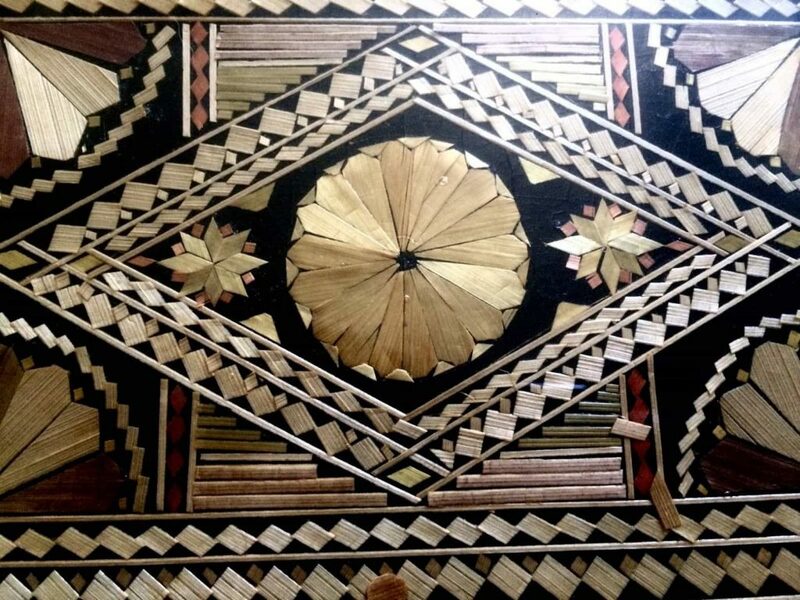 Some straw work is precision fine with hundreds, if not thousands, of micro cut pieces of straw, while others are more simple in their style and required less material, time and skill to create. Were there opportunities for prisoners to financially benefit from making them at some time? If public sale were possible there would be dates or written records of some sort somewhere. But where could the trays be sold? Were they available for purchase in popular tourist/cruise areas somewhere? If so where? In what tourist cities could they be purchased and then brought home ? Why are they found in the United States if they were made by prisoners for their family members as gifts? The trays were made by the hundreds if not thousands for all that’s known. If prisoners made them over the course of years it is possible, depending on the prison, thousands could have been produced and sold to people. When and for how long were they made is simply not known. It is known they are not produced anywhere in the world today. In any event, we thought the straw trays were an interesting subject to share and pose questions for thought. They are absolute Mystery Straw Trays to The Straw Shop. 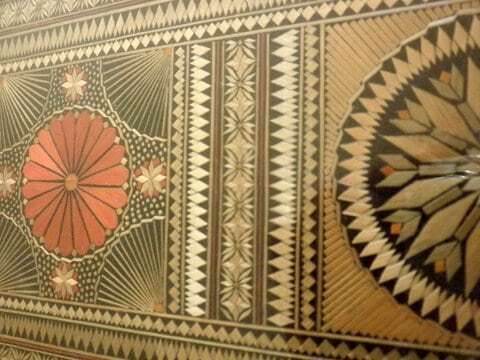 They are very special examples of straw art work with absolute unknown origins. Their history is folklore so far, spanning 130 years of explanations. 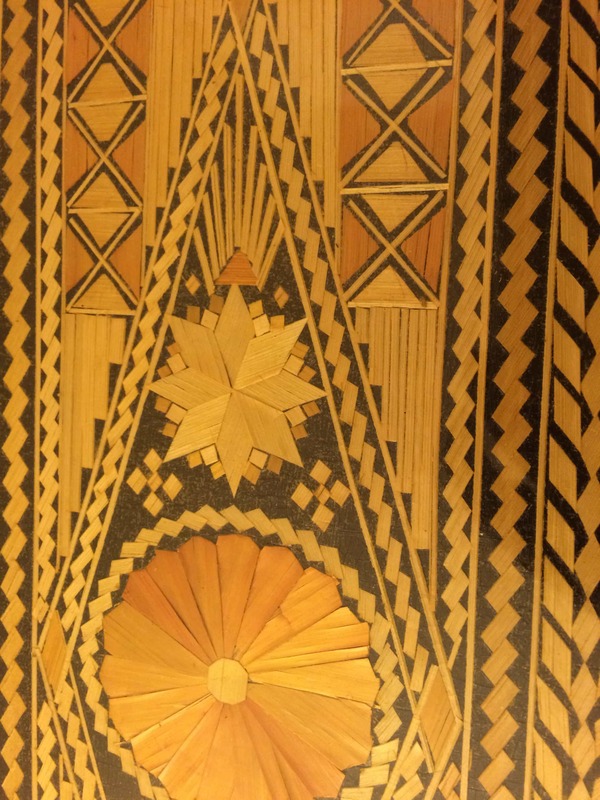 There was a man, named Martin Howe, then Curator at Peterborough City Museum, in England, who undertook a lot of research into straw marquetry because of the museum’s important collection of straw work from Norman Cross. 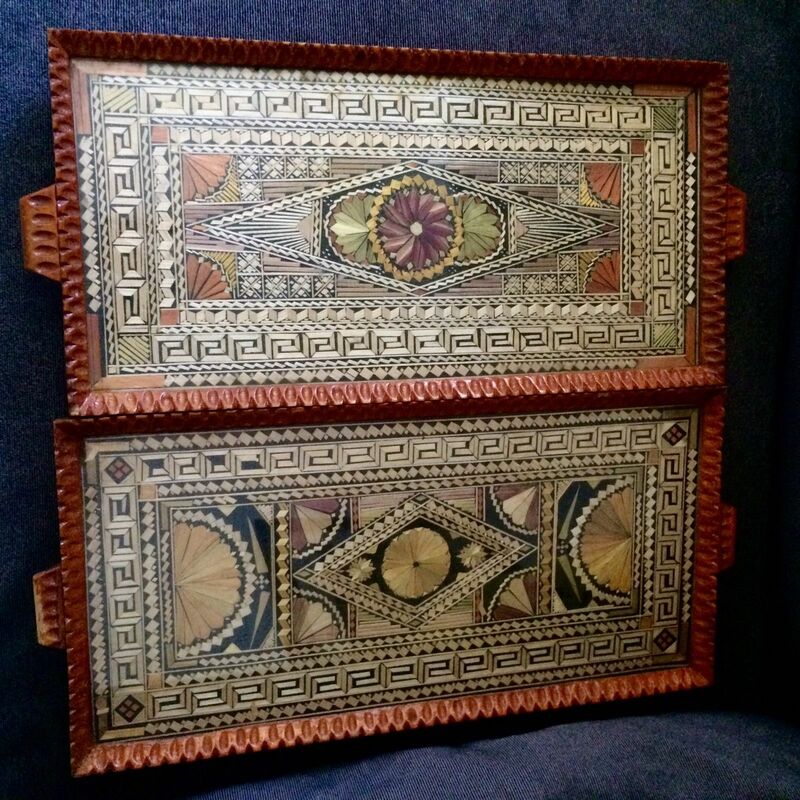 He was considered an expert on the history behind these straw trays and first mentioned they were made in Greece. He never documented his findings regarding the trays and unfortunately has since passed away, along with his invaluable straw art knowledge. 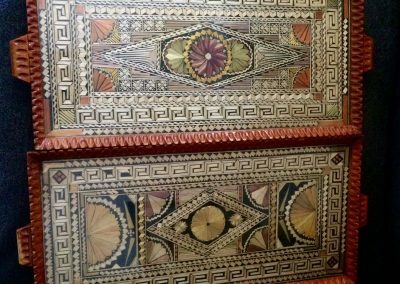 One explanation offered is they were made by three groups of prisoners in Greece: Italian, Egyptian and Greek prisoners. Based solely on observation, The Straw Shop believes this to be straw art work done by incarcerated people in Greece for two reasons. 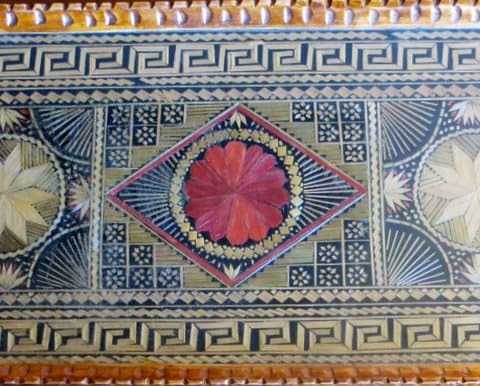 The first reason is due to the Greek characters appearing on some of the trays. No other language style of lettering appears on any other tray we have located in our research thus far. Subject to change. 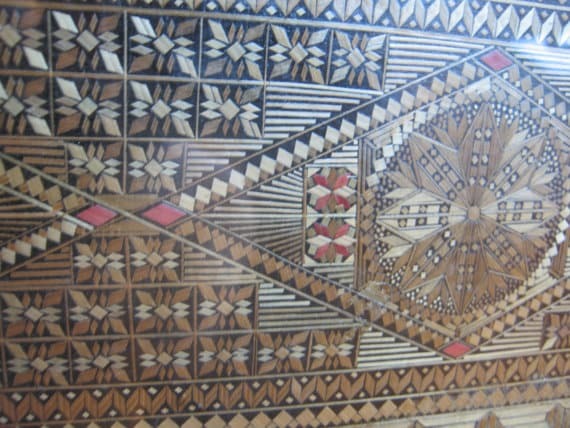 The second reason is the variety of straw work styles that have been created and the unique artistic design of each tray. 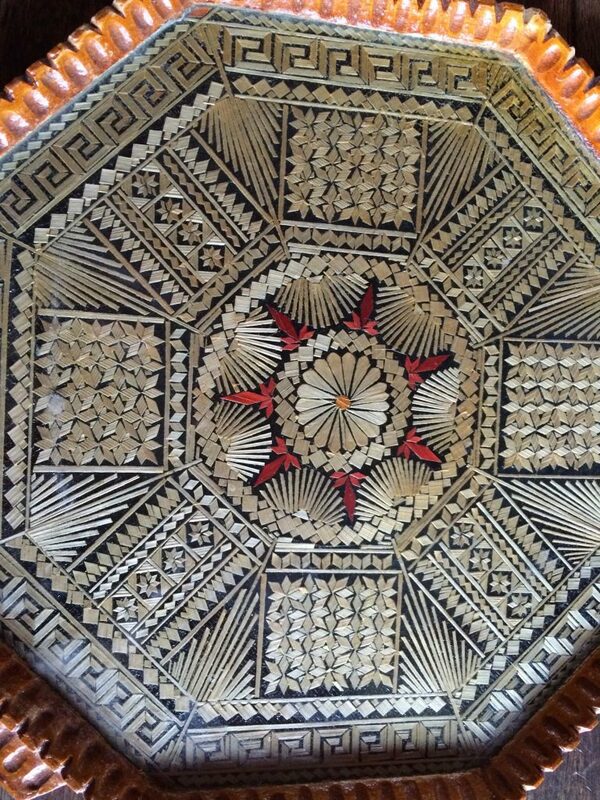 Every tray is constructed and decorated by self taught artists who had the time available to make them. If that is correct, do these trays become prisoner art work? If a war caused these men to be incarcerated does their work become Prisoner of War straw work? The possibilities are endless and at times plausible. So we are asking for your help. 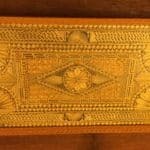 The mystery trays deserve to have their story known and documented.